It is Thursday here in Aarhus, Denmark, and today Oliver and I attended an academic conference called “Social Perspectives on Autobiographical Memory”. About 115 people from around the world have gathered to hear lectures on autobiographical memory and to present their research. This morning there were three keynote talks: one on memory errors and distortions, one on social influences on children’s memory, and one on memory and identity. All fascinating! After lunch we had a “poster session”. This is where people pin up posters that describe their research. It’s the same idea as a poster for a school project, except the posters are usually bigger and printed on fancy material. You hang your poster on a board and then stand beside it for 1-2 hours while people at the conference walk around, read the posters and talk to the owners of the posters. This afternoon five people from my department and research team at Macquarie presented posters: Adam Congleton (top left photo below), Aline Cordonnier (top right), Rochelle Cox (bottom left), Amanda Selwood (bottom right) and Misia Temler (who escaped my camera). They got lots of comments and questions. 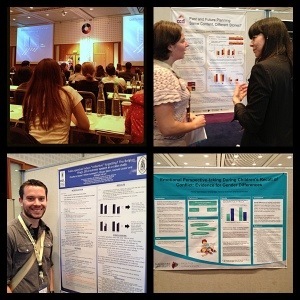 I presented a poster for Penny Van Bergen (bottom right photo below), which also got lots of useful comments and questions (which I will email to you Penny!). 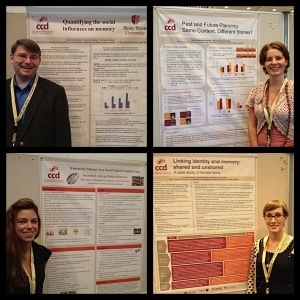 Finally, we saw many of our colleagues and friends from around the world presenting their work, including Charlie Stone (bottom left photo below) who did a PhD with us at Macquarie, is now finishing up a postdoctoral fellowship in Belgium, and soon will be on his way to a new job in New York. Oliver was very happy to make a friend today. A nine year old boy from Turkey, Selim Tekcan (right photo below) who attended the conference with his father, academic Ali Tekcan. Oliver and Selim kept each other company throughout the day, swapping suggestions for iPad games, playing Minecraft together and generally hanging out. This meant that they spent what could have been quite a boring day in good spirits and very well behaved during the formal talks. Everyone at the conference thought they did brilliantly and enjoyed talking with them. This afternoon we went to a reception at the Aarhus Town Hall – a very beautiful and quite famous building (left photo above). 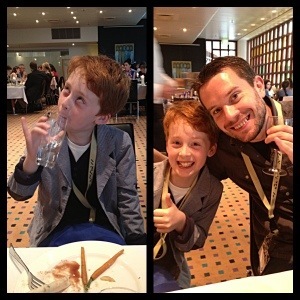 Then we went to the conference dinner, where Oliver sat next to Charlie and had a grand time. He’s hoping to see Charlie again tomorrow and then in Rotterdam when we all head to our next conference. Everyone at the conference made Oliver feel extremely welcome and he made me proud with his excellent behaviour. In fact, I think he enjoyed being the centre of so much adult attention, especially in his fancy conference dinner jacket! In the morning I give my keynote talk, which I hope will go well. So I better get some sleep! 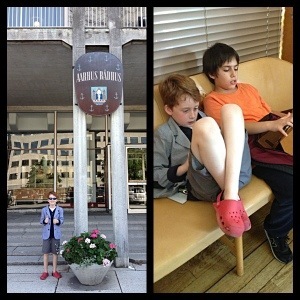 This entry was posted in Conferencing, In Aarhus on June 21, 2013 by Amanda Barnier.